If you thought quartz kitchen worktops from leading brands such as Compac, Silestone and Caesarstone are in demand only because of their high quality, durability, and magnificent finesse, you may be mistaken. These are not the only reasons. Today, when more and more people worldwide are looking for environmentally sustainable products, quartz worktops make for an excellent eco-friendly choice for your kitchen. Compac quartz worktops, Silestone quartz worktops, and many other brands are very popular in the UK and also worldwide scale because of their resistance to mould, scratch, stain and mildew. In addition, these are available in a wide array of colours to suit different kitchen styles. However, one more quality that makes quartz worktops extremely popular is their eco-friendly quotient. What makes quartz worktops eco-friendly? 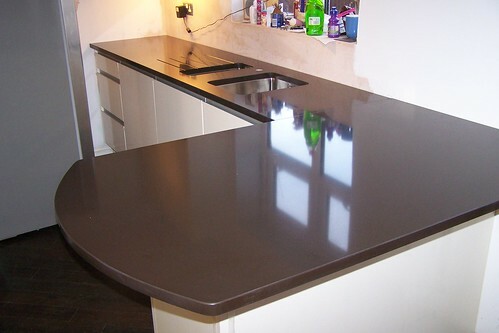 Most quartz work surfaces used for kitchen worktops, vanity tops, flooring, wall cladding etc. are engineered stones made from blended polymers and resins. Products in the ‘Compac Nature’ range are being manufactured using high technology Bio Resins that come from renewable vegetable sources. In fact, world’s leading brands such as Compac are committed to manufacture recyclable Quartz products using 100% recycled raw materials and other products unused in other industries. For instance, quartz is a frequently obtained secondary product in glass and mining industries and does not require quarrying like other rocks. Quartz stones from renowned brands are manufactured using eco-friendly processes that are continuously reviewed. Advanced technologies are used to ensure optimal utilization of natural resources and raw materials in the form of less power consumption and improved efficiency. For instance, Compac uses a special material for ventilated facades that leads to significant power savings in buildings. They are also using advanced technologies for processes such as block cutting and polishing to reduce power consumption and increase the efficiency in the use of raw materials. In addition, 90-94% of water used in the manufacturing processes is treated and recycled. There is also quartz products that are Greenguard certified for their low VOC (Volatile Organic Compound) emissions which makes these compliant with indoor air quality safety standards. Several leading brands manufacturing quartz are adopting different measures as part of their environmental commitment. For example, these companies are making reforestation efforts in order to compensate for their plants’ carbon footprint and the CO2 impact on the environment. The durability of quartz worktops also increases their eco-friendly quotient. This is because these work surfaces last for so many years that you may not need to buy new worktops in future. And, not buying a new countertop is another way to ‘go green’. In summary, these engineered quartz work surfaces will not only add class to your kitchen, but also serve you for many years. Most importantly, these kitchen worktops are manufactured using processes that have minimal adverse impact on our planet. If you are looking for eco-friendly Compac quartz worktops or other renowned brand work surfaces in UK at affordable prices, it is always advisable to go for only reputed suppliers and dealers. This entry was posted on Monday, November 23rd, 2015 at 2:19 am and is filed under Kitchen Designs. You can follow any responses to this entry through the RSS 2.0 feed. You can leave a response, or trackback from your own site. How is the Structure Supported?